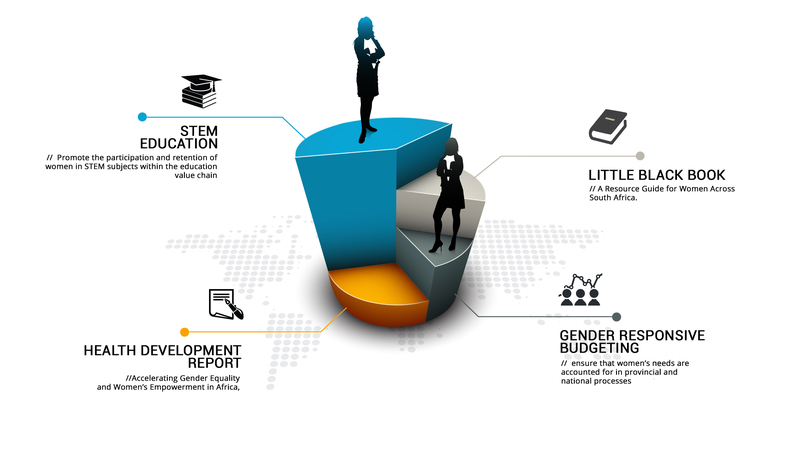 Information in the form of the Little Black Book to empower women; gender responsive budgeting to ensure that women’s needs are accounted for in provincial and national processes; and STEM education to promote the participation and retention of women in STEM subjects within the education value chain. Recognising that supporting girls and women in STEM is one of the most central pillars for Africa’s equitable sustainable future, building a STEM pipeline for girls is a key focus for the Motsepe Foundation. A 2016 report by the United Nations Development Programme (UNDP) shows the staggering costs of not investing in women. This equates to a loss of US$95 billion a year to the continent’s GDP for maintaining the persistent gender gap. The South African Government is committed to closing this gap through various policy and legislative measures and international conventions, protocols and frameworks, the objectives of which are to advance gender equality and women empowerment. Despite progress, there is also cause for concern, especially in the areas where we are moving too slowly or are far behind, such as gender-based violence, maternal mortality, access to finance and markets, gaps in enrolment and retention of girls in STEM. The Motsepe Foundation Women’s Unit was created in 2012 with the aim of empowering women to be equal partners in driving the development agenda at national, sub-regional and regional level and supporting the Foundation’s efforts in achieving its core objective of alleviating poverty and improving the lives of the poorer segments of the population, including women. This approach is premised on the fact that development challenges, such as poverty, gender-based violence, healthcare and education systems, access to finance and enterprise development all have gendered dimensions and disproportionally affect women more than they do men. The Foundation is determined to help raise the socio-economic status of women in South Africa, to enable them to contribute more effectively to their families and communities. The Unit’s objectives complement and provide synergy to the broader work of the Foundation by ensuring that women’s concerns are taken into account in every programme. The key focus areas for the Unit include health, economic empowerment, research and gender-responsive planning, programming and budgeting. Emphasis is placed on initiatives that can enable women to narrow, and hopefully eliminate, gender inequality and the severe economic imbalances that continue to negatively affect them. Two key initiatives are The Little Black Book and the Gender Responsive Budgeting Initiative. Climate change is one of the most pressing issues of our time, with a particular impact on poor and marginalised communities. The Motsepe Foundation supports the Leonardo DiCaprio Foundation in its work to address this environmental and social challenge.